I decided not to keep you in suspense too long, so here’s the top half of the bookcase we started exploring last week. You can see off to the left there where I have a custom-made dry erase marker cup from my friend Z. It looks like a castle from the front! I’m meant to draw in some brickwork on it myself, but I never get around to it (much like the ear plugs I still owe him, d’oh!). Most of the stuff on these shelves are easier to see behind to the books, so there’s only one that got a double photo, but to make it up to you I also photographed the stuff on top. This is the fifth shelf, counting from the bottom up. 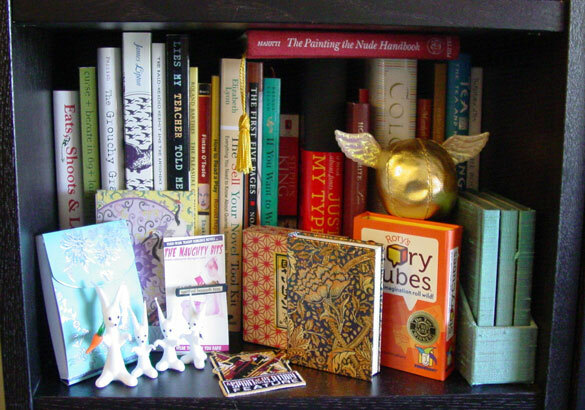 It’s got blank books, inspirational toys, glass bunnies from Brazil, and more books! The box of three blank books bound in raw silk is just begging to be some fascinating little project someday, and the other little blank journals and notebooks are just too nifty to write in. The golden Snitch is a plushie, and that red-patterned box contains another sort of collectible of mine — more boxes! In this case it’s full of hexagonal nesting origami boxes from Japan. The books are a mix of grammar, writing, design, and tea books, but I believe the whole shelf is nonfiction. This means I’ve read very few of them, because I get really easily bored reading nonfiction. So bored. This shelf is teeny tiny! It’s just the right height for the stuff inside, which includes what’s left of my Pez dispenser collection, and some really awesome wee Nightmare Before Christmas statuettes. They are very cool, and also incredibly delicate, which is why they live in their packages right now, though I have in the past displayed them properly. There’s also Pooh and Piglet, acquired at Disneyland years ago if I recall correctly, and an electric candle. 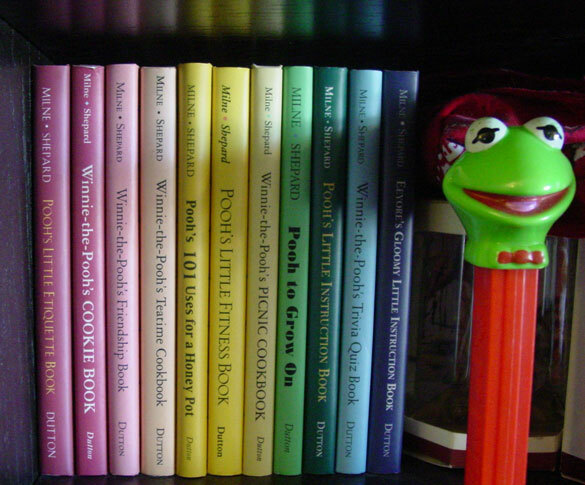 And here we have the one and only place I arrange books by color, my collection of “Pooh’s Little Book” books, all silly little mini-books with quotes and art from the classic Pooh books. There’s even a copy of Eeyore’s Gloomy Little Instruction Book on the end there. 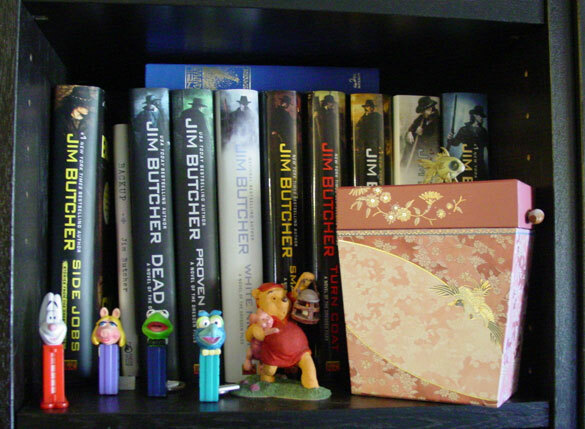 And here we have shelf seven, containing all of my Dresden Files hardcovers, a random fancy copy of Stardust, and chibi Pez. Also, Pooh and Piglet looking adorably scared, some random stationery, and a zombie fish. On the topmost shelf, we have the British editions of Harry Potter 1-7, along with some other related things and a random copy of one of those Scary Stories books I read as a kid. I always loved the illustrations, so when I found this anthology on a Halloween sale table for cheap, I snagged it. 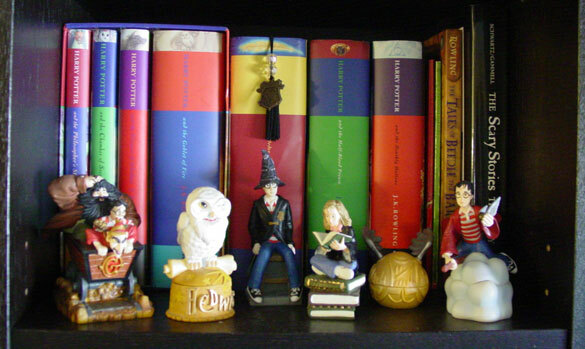 In front are these absolutely delightful Harry Potter decorative boxes. Decorative boxes are seriously a weakness of mine, you guys. They have a little charm inside each one, so Hedwig’s is a cage and the Snitch has a broom and Harry on his broom has a Snitch. So awesome. 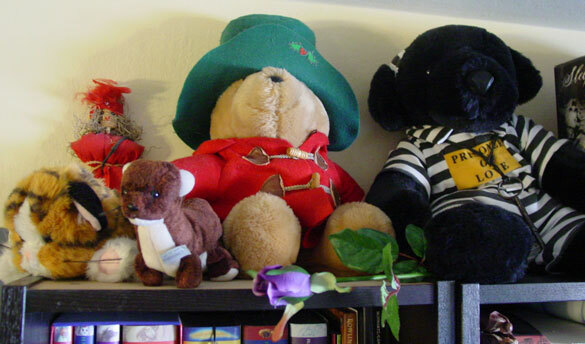 And finally, at the very top, we have plushies! There’s the zombie kitty that I lobotomized to see how his purrer worked, a ferret given to me with his nametag on, Paddington Bear complete with marmalde under his hat, and Sirius Blackie in his Prisoner of Love uniform. And a random purple rose, because why not? I hope you’re enjoying this little tour of my studio, life, and brain! Next stop will be the paperbacks, which are 2 deep on the shelf and have their own bizarre assortment of collectibles and oddities.